"It smells like rotten eggs. The air is hazy and gray with gunpowder smoke. Everyone has been shot but me. I haven't got even as much as a bruise." 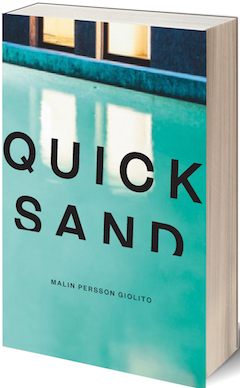 Malin Persson Giolito's Quicksand opens with a tableau, featuring Dennis, a fat teenager from Uganda; Samir, an academic overachiever; Christer, the homeroom teacher; Amanda, "all cashmere, white gold, and sandals"; and the son of the richest man in Sweden, cradled in the narrator's lap. "People like us don't usually spend time together. Maybe on a Metro platform during a taxi-driver strike, or in the dining car on a train, but not in a classroom." Maja Norberg is on trial for her role in a school shooting that left her boyfriend and her best friend dead, among others. She has been waiting in isolation in a women's prison for nine months. Media attention has been intense and frenzied: Maja comes from the privileged upper class of Djursholm, a wealthy suburb of Stockholm. She was a good girl, reasonably well-liked and a good student. She has been portrayed in the news as a poor little rich girl, self-centered to the point of disregarding the value of human lives. In flashback chapters, Maja's story slowly becomes clearer. Bit by bit, her relationships with her alleged victims are revealed. In two sections--one handling the trial and the other leading up to the shooting--Maja's first-person perspective offers a shifting view of the world. "I read somewhere that 'the truth is whatever we choose to believe.' Which sounds even more insane, if that's even possible. Like someone can just decide what's true and what's false?" Quicksand is Persson Giolito's fourth novel and her first to be translated from Swedish into English. Translator Rachel Willson-Broyles smoothly renders Maja's voice, by turns cynical and yearning, hard-edged and vulnerable. Paired with a knack for deadpan dialogue, this voice presents a realistic impression of an 18-year-old woman, one charged with the most heinous crime in her country's recent memory. The strength and poignancy of Maja's nuanced voice command sympathy, even though she has--perhaps--done terrible things. The central question of the novel is, of course, Maja's guilt or innocence. Although the trial itself shapes the narrative, she is reluctant to make a claim about her involvement in the shooting, even in thought. Readers must follow along slowly in dual timelines, trying to determine the shifting truth for themselves. Meanwhile, Maja's story imperceptibly expands to take on larger questions and issues: class and immigration, race and racism, criminal justice systems and the media, the consequences of wealth and leisure, love and obsession, what is owed by a parent to a child. The false dichotomy of guilt and innocence plays a central role. It is to Persson Giolito's great credit that such weighty topics move smoothly through a plot that is taut and relentless, even as its protagonist passes monotonous days in a prison cell. Because Maja's traumatized, often apathetic perspective offers the reader's only view of this story, characterization takes place slowly and leaves holes. Her family and classmates matter only as they matter to her. Dennis, her boyfriend's drug dealer, is of little value. Amanda is both an intimate and an empty-headed cipher--Maja's best friend, like a sister, but alternately familiar and remote. Maja has a real sister, too, who plays a very different role; her parents, unsurprisingly, are due for a certain amount of Maja's scorn. Sebastian's character is at the crux of the plot's mysteries, standing in for all the contradictions implied by wealth, success and dissatisfaction. Maja and Sebastian's romance begins with 15 days in the Mediterranean on a yacht almost 60 meters long, and she comments more than once on "the surreality of it all, that world of postcard-blue and sparkling sunshine and plink-plonk manicures." This surreality drives home that sparkle and money don't buy happiness. Maja will ponder that lesson and others as the trial progresses, as the reader gradually puts together the pieces of her story and as her fate looms. Malin Persson Giolito was born in Stockholm in 1969, and grew up in Djursholm, Sweden. 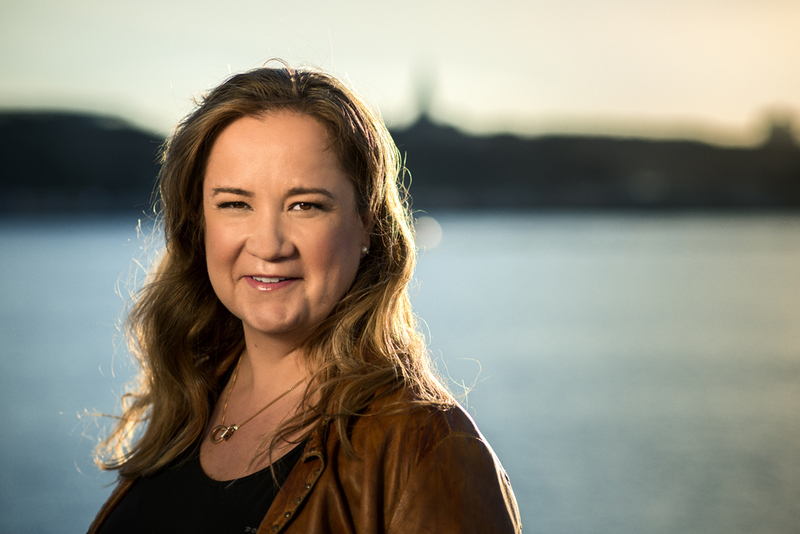 She holds a degree in law from Uppsala University and has worked as a lawyer for the biggest law firm in the Nordic region and as an official for the European Commission in Brussels, Belgium. She is now a full-time writer and has written four novels; Quicksand is her English-language debut. Persson Giolito lives with her husband and three daughters in Brussels. Was it the crime that sparked this novel for you, or Maja herself, or something else? I couldn't stop thinking about the crime. But it's quite a difficult subject to write about, especially if you want to write a book people actually enjoy reading. I didn't get anywhere until Maja came along. And I think the reason I wanted to write about a school shooting was not particularly the crime itself but the environment, that is, the school. It's a very closed kind of environment. I think the book is about situations that you can't control, and closed rooms. Maja was the key to the story. The first idea was the school shooting, but I didn't know what to do with it until Maja came along. It's quite funny: as a writer, you're probably the least capable of talking about your novel. You don't really know what you're doing. For the longest time you're doing this puzzle upside down, so to speak, and then when the book is done hopefully you will see what the puzzle looks like, or perhaps one of the readers will tell you. There is something about this closed room that must have intrigued me, because we have not only the school but also the courtroom and the neighborhood where she grows up, which is an upper-class, very closed neighborhood--they're very isolated from other parts of the Swedish society. Also, being a teenager is being isolated. You live in your own world of black and white, right and wrong, love and hate... teenagers are lovely. I have two. But they're also quite isolated in their own minds, in their own day-to-day world. You write the voice of this teenager so convincingly. I have a tendency to say this was the easy part, but that's not really true. It took me a lot of time to get to her. But once I had her, that was the best part, just living inside her head, with her rage and her judgments. She's an enraged teenager. She's a very privileged teenager that has gone through this tragedy, and now she's put in a place where she has absolutely no control over her situation anymore. And we learn that during the year that led up to these events, this tragedy, she also lost control of her life. So how does she react? Well, one of the reactions is this rage. She hates everyone. And funnily enough, that was when I liked her. I think there must be an enraged teenager within me. I think we all can relate to this loss of empowerment when we look at the world around us right now. One of the things I really liked was that I didn't have to be this thoughtful adult who sees the good in people--I could just let go of everything and just be her. Which is not the same as saying that I agree with her. Her way of judging people around her is not something that I necessarily share. But it was still surprisingly easy, once I was there, to just do that. Once in a while you just want to let it go, to quote a famous Disney princess. I really liked that with Maja. One of the tricks, when you write suspense novels, is to use the unreliable narrator. And when I started writing I knew from the beginning I didn't want that. I didn't want her to turn out to be someone else, didn't want her to wake up after having had an alcohol-related dementia, or whatever. I wanted her to be reliable narrator, in the purest sense of the term. But I didn't think of the fact that she's a teenager, and if you look up "unreliable narrator," I think you'll see a picture of a teenager. But she's just her, and that was very important. That's what made me really love her. She just wants to get through this. She's a survivor, in more ways than one. What in your background prepared you to write this story? The fact that I'm a lawyer prepared me a little too well, I think. There are parts of courtroom procedure that interest a lawyer that are not interesting for anyone else. It's easy to take certain things for granted, certain principles. But once I had Maja, this was an advantage. Because she could ask all those questions that lawyers are supposed to have moved away from. Maja's first big question is, how can you say that you're innocent until you're proven guilty? That is absurd. Either you're guilty from the beginning or you didn't do it. That's not something that a court can change. Obviously this is a core problem. These are the Ten Commandments for a lawyer. Maja made me question my own Ten Commandments, which is fantastic. When it comes to growing up in Djursholm--and it could be any rich neighborhood because they all more or less look the same, I think--I grew up there with a single mom who worked as a nurse. I'm not saying I had a hard childhood. I was privileged. But we didn't have the economy of my classmates, so to speak. I think that the fact that I grew up there not as a rich kid has made me a good observer. Or I hope so. I knew that I wanted to write a story about the way that our society looks today, with all the differences and the inequalities, and the growing gap between the people who are the richest and those who have the least, and I knew that this was my angle. A lot of people ask me if I've eavesdropped on my own teenagers, but I don't think that you can. They helped with music, and Snapchat, and whatever, but I've tried to avoid naming all those things anyway, because they change so quickly. Obviously it helped that she was in isolation, in jail. It was good for many literary reasons, actually. If you want to write about the life of a teenager one of the problems is they have so many friends and they do so many things. I just said that their world is very small, but it's also true that their world is very... scattered. And I didn't have to worry about that while she was in jail. You speak English very well. How does translation work when you are proficient in both languages? I was lucky to be translated by Rachel; she's absolutely fantastic. It's one thing to speak a language--I can see that this is a very good translation--but I'm not an English speaker. We would have a discussion to find something equivalent or take it out entirely, which we did in a few instances. I think it worked very well. There are actually two versions, the same English translation, but one is more British. And maybe because I'm more Americanized than I am British, it feels strange to hear Maja speak British English. I don't know why. I can see her as an American teenager. It doesn't strike me as odd. I'm involved, but more as an observer than as a translator. I can't translate my own text, but I can applaud. Is this novel a departure from your previous work? Quicksand stands out because it's Maja's book, it's so much just her, she's the only voice that we hear. All of my previous three novels have lawyers as main characters. The first one is not a suspense novel; it's about a woman who works in the biggest law firm in the Nordic area and she gets fired when she's expecting her third child. And I wrote that novel, coincidentally, just after being fired from the biggest law firm in the Nordic area, while expecting my third child. My third book is about a man that has been convicted of murdering a 15-year-old girl, and he's been in prison for 11 years when he gets a new lawyer--my main character--and she tries to get him off. That is more traditionally court-related, more like this one in that sense. The other is about a lawyer representing a seven-year-old boy who is cared for by the state's social authorities. Very sad story. I have readers who say, do you ever write anything where children are not hurt? Nope. Always very depressing. I don't know what it is. I always say to myself that the next one is going to be a fun, lighthearted, feel-good novel, but it never works.